Even though the title is “Soup Stock”, stock is used for more than just soup base- sauces, gravies, and stews, and probably something else I can’t think of right now. We use stock in a lot of the recipes you’ll see here, so I thought I’d do a post on making stock now so I can link to it when I refer to recipes using stock. When we make stock we freeze it in portions to use later. You can use canned broth instead, and we do when we’re out of the homemade stuff. But if you really want your recipe to be special, using homemade stock is the way to go. By the way, you may wonder “what’s the difference between stock and broth”? Not much really, but stock is generally made just from bones while broth has meat added. Depending on how much meat is left on the bones you use, this recipe is somewhere between the two. We’ll use the terms “stock” and “broth” interchangeably on this site. Stock can be made with either bones that are raw or bones from already cooked meat. Using the leftover bones from a whole cooked turkey or a rotisserie chicken or two is a great way to make the most of your food budget. We like to take the turkey bones on the Friday after Thanksgiving and make stock and then a big pot of turkey soup– turkey bones make a great stock. 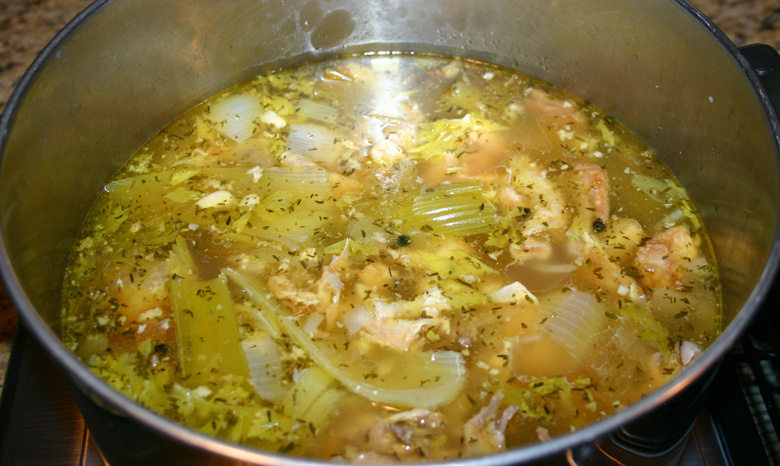 The picture above is chicken stock, but the principle is the same whether you want to make turkey, beef, or even a seafood stock using shells from shrimp, lobster, and/or crab. You can also use just vegetables and seasonings for a veggie stock. The ingredients below are what I used for this particular stock, but it’s really just a guideline– you can throw just about any veggies or seasonings in there for the stock. First, remove meat from the bones and save it for the soup if that’s what you’re going to make. You don’t need to clean the meat off the bones too thoroughly- meat left on will add flavor, and make it more of a broth, as mentioned. Put the bones, skin, etc- whatever’s left over after the meat is removed- in a large pot. Chop the vegetables coarsely. You don’t have to do much cutting, and you don’t even have to remove the skins on the onion and garlic if you don’t want to- it’s all flavor. Throw the chopped vegetables and the rest of the ingredients in with the bones. Notice there’s no salt added- I keep the stock low-sodium until I decide what I want to use it for. If you add salt now it will be too salty if you want to reduce the stock later. Fill the pot with water until it covers everything by an inch or two. You want to end up with a lot of stock, but not so much water it dilutes the flavor. Put the pot on the stove and turn the heat on high until it just starts to boil– then turn the heat on low, cover the pot and simmer. The water should just barely be bubbling. Let it simmer for at least 4 hours to make sure to get all the flavor. You can’t really cook it too long, but more than 5-6 hours is probably overkill. if you’re not going to use the stock right away, you can let it cool to room temperature and then refrigerate it. Once it reaches refrigerator temp, the fat will be the solid waxy stuff on top, and it will be easy to remove. A tip for rapidly cooling the stock: put the pot of stock in the kitchen sink and fill the sink with cold water, up to the level of the stock inside, or until the pot is almost (but not) floating. Make sure the pot has a lid on it so sink water doesn’t accidentally splash in. if you do want to use the stock right away, let it sit for a minute so the fat comes to the top. If you have a large glass container to hold the stock it will be easier to see the “oil slick” of fat on top. Use a large serving spoon or ladle and carefully skim the fat off the top. If you do refrigerate your stock, you may notice it solidifies and turns “jiggly” like jello. This is a good thing- it’s collagen from the bones. This makes for a better consistency to the stock-, and it’s one thing (along with the superior flavor) that distinguishes home-made stock from canned broth. Put any stock you don’t use right away in the freezer. I use quart-size plastic freezer bags with the date written on them. You should use frozen stock within around 6 months.